Yep, it's the most unexpected sequel ever! But don't expect anything like the original. Whether you love or hate Iron Angel of the Apocalypse, your opinion of The Return is bound to be very different. 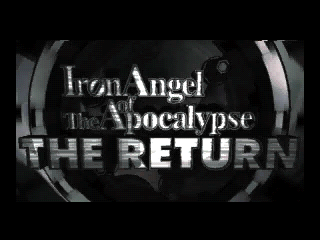 To summarize the fundamental differences between the two, if Iron Angel of the Apocalypse was the 3DO equivalent on an independent art film, Iron Angel of the Apocalypse: The Return is the equivalent of a low budget sci-fi action flick. The story picks up some decades after the original left off. Despite the death of the mad scientist and the destruction of his tower, his assimilation process has achieved mainstream acceptance, and the world-dominating corporation SCR is successfully persuading people to be turned into robots. They've also repaired the scientist's two Tetsujin prototypes. A test pilot fatally injured in a crash is used as the new mind for the second Tetsujin, and guess what, Tetsujin #1 wants some payback for what happened in the first game. Despite this continuity with the first game, the story is a huge departure. It's here that my "low budget sci-fi action flick" analogy is most obvious, because the plot makes little sense if you give it a moment's thought, and to distract from this, there are a lot of action sequences with big explosions, fast vehicles, double-crosses, and cliffhanger escapes. 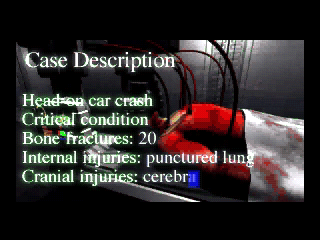 This is about as far as you can get from the small cast and austere storyline of the first game. To add to the cheesiness level, the series no longer sticks with English subtitles, and instead features amusingly bad English dubbing. No more live actors, either; even the human characters are done in CG. The technical aspects are hugely changed as well. There's still an HUD, but areas are much more wide open, and you'll often meet several enemies at once. Despite this, the frame rate and draw distance are both dramatically better and the slowdown is less conspicuous. 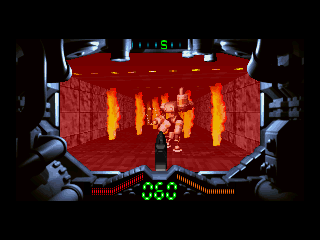 These technical improvements also allow for a major change in gameplay: Iron Angel of the Apocalypse: The Return is a conventional first person shooter. 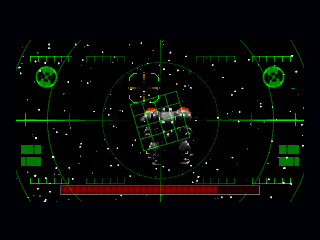 Where the key to success in the original was identifying specific enemy strengths and weaknesses and developing techniques for how to deal with them, in this one it's a simple case of strafing and shooting as fast as you can. But the game is a bit different from your garden variety shooter. There are no health or ammunition pickups, since they both replenish automatically. In addition, you have a shield which you activate by pushing a button, and absorbs most damage while activated. Unfortunately, this system makes the game brokenly easy. Though the shield turns off a couple seconds after you activate it, there's no wait period between uses nor any penalty for using it. This means that if you just keep pushing the shield button, you're virtually invincible so long as you have shield energy, which replenishes itself very quickly. There's little need to dodge when all the damage you take from one group of enemies is healed up by the time you reach the next group. Even the few bosses are little trouble, since if you ever run low on health, you can just find a corner to hide in and in a minute you'll be good as new. 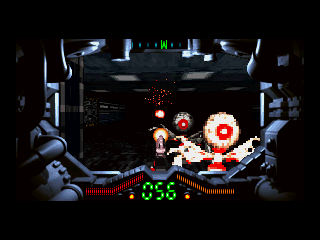 To change things up, and give the game more of that "interactive movie" feel, there are also a couple rail shooter levels and some on rails vehicular stages. These are both too simplistic to really add value to the game, but it's hard to complain about them since they're so short, and more variety is nice. As in the first game, you've got an apparently friendly robot transmitting tips to you, but this time they're about six times as frequent. There are points where you'll be stopped to receive a transmission on the same exact subject multiple times while walking down a single corridor. Since the transmissions take considerable time to load and consist of one sentence each, this is extremely obnoxious. 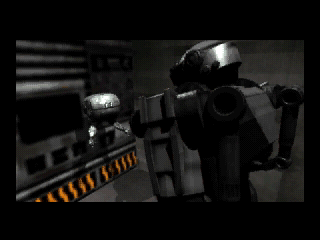 In sum, Synergy tried putting more of everything into the sequel - more stages, more FMV cutscenes, more characters, more plot twists, more weapons, more gameplay styles, more frames per second - and it all ends up feeling like something less than the original's single tower stage with three characters and focused dungeon-crawling gameplay. Sure, the technical aspects are improved, but they actually feel worse because now the gameplay style is one where the technical aspects really matter. The level designs are much more straightforward as well, and with no health or ammunition to worry about, pretty much all you do is head straight for the exit. The Return has a lot of kitsch value, and there's B-movie fun to be had in immersing yourself in the story and cutscenes. The appeal of the game is a lot broader than that of the original. 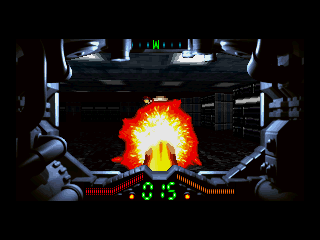 Ultimately, though, it's really only for first person shooter fans who are already sated on the 3DO's more respected offerings in the genre, i.e. Wolfenstein 3D, Killing Time, PO'ed, etc. It has considerable interactive movie flash, but the substance is somewhat limited. Graphics 5/10 - The sprites are decent but the backgrounds lack the striking tone of the original game, and the frame rate is low. 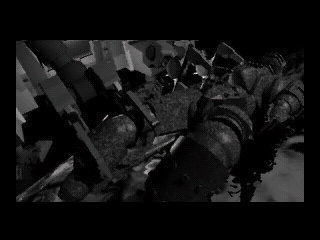 The FMV is solid if a little too flashy. Sound 4/10 - The soundtrack is as dark and brooding as the original's, making it painfully out-of-place here. The voice acting is amusingly bad. Longevity 4/10 - There's a decent amount of stages, but the light difficulty and absence of replay value ensure this one won't last you very long. Interactive Cinema 7/10 - The story doesn't make much sense but is full of fun drama, and the additional gameplay modes and timed sequences help draw you into it. Iron Angel of the Apocalypse: The Return aims high as an interactive movie, but its shallow gameplay, solid pacing, lack of challenge, and direct-to-video storyline combine to make an action romp which is fun while it lasts, but ultimately unfulfilling. 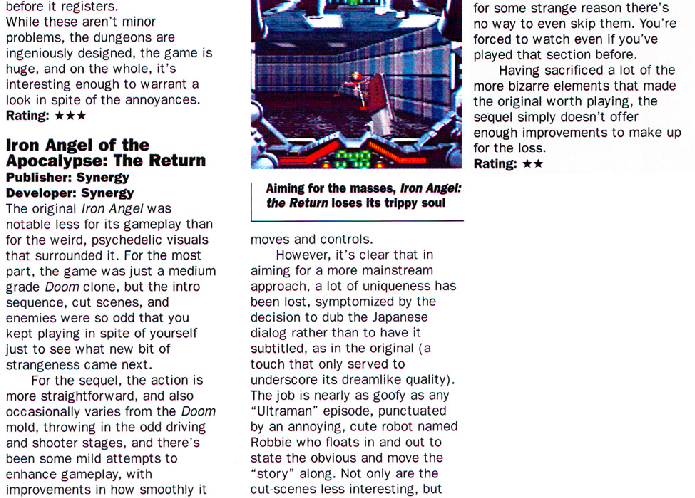 I haven't played IAotA or its sequel, but your review makes it pretty clear what the games are "about". I look forward to giving a more fully reasoned response once I've played 'em. Fear not Martin, I'm reading it at the very least. I just don't know how to articulate a response, other than to say, I appreciate the work you have put in and it has prepared me with some low exceptions when I get to this one. I'm actually on Space Hulk again. Totally forgot to reply here, but I did read you guys' posts when you made them, and your words are much appreciated. I haven't posted reviews on here in a while, but I will be getting back to it at some point. If nothing else, I have my review of Snow Job about 40% done already, so I'm definitely going to finish that. I just found this contemporary review of the game in Next Generation #15 (March 1996) and was floored by how it echoed precisely my own sentiments. The similarity is almost scary, but it's cool to know that someone else out there had the same reaction to the game as I did, all the more so when that someone is a professional critic.